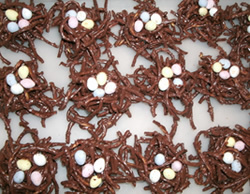 How about a clever recipe for Chocolate Birds Nests that the kids will love to make and to eat? I've seen - and eaten :) - this candy before, but it was called haystacks. You can call them haystacks, too, if you are using a country or farm theme for a kid's birthday party, or just for a rainy day of play in the house. I hope you enjoy making chocolate candy recipes for kids with your own children. It's really a wonderful opportunity to build memories with them that they will remember for life. It really doesn't even matter how good the candies turn out - although these birds nest candy are so simple you can hardly go wrong. This recipe is extra tasty if you use Jelly Belly jelly beans candy to put in the nest as the eggs. They are full of flavor and they are smaller than the average jelly bean. If you want to use this recipe to make your own party favor for your next children's party, why not pick up some cello favor bags at Candyland Crafts, along with twist-ties or ribbon for finishing them off. This chocolate birds nest recipe is simple and easy to make. Give it a try! Prepare a tray by lining it with waxed paper. In a microwave safe bowl combine chocolate and peanut butter chips and the shortening. Microwave for 30 seconds at a time, stirring after every heating until smooth. Do not overheat! Add the chow mein noodles and stir well to coat them completely. Drop by heaping tablespoons on to the waxed paper lined tray. Gently press down with the spoon to form a small well for nests. Place mini jelly beans candy in the nest while the chocolate is still warm so that they will stick. Chill if necessary to set, and store in an airtight container in the fridge.